Can you bring a holiday accident claim against your tour operator? If you have suffered an accident on a package holiday abroad, you could receive thousands of pounds in compensation from your tour operator. Yet many people are unsure whether they booked their holiday as package, and whether they can receive compensation. 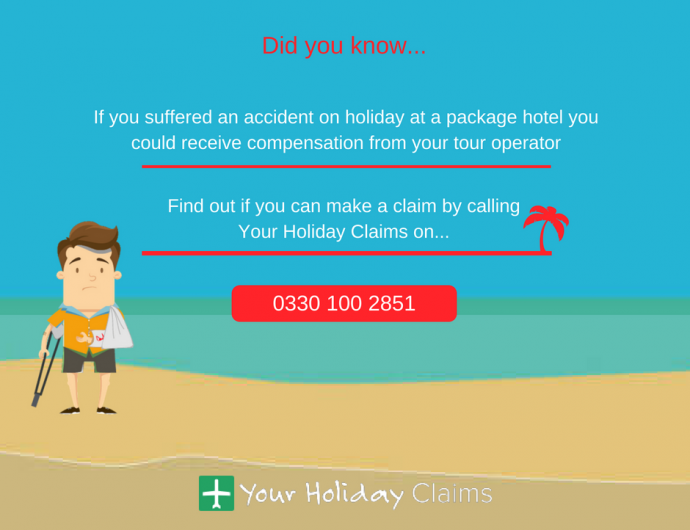 To help understand whether you can make a claim, YourHolidayClaims have provided a guide on making a holiday accident claim against a tour operator. What is the law on making a holiday accident? When you travel on a package holiday you are protected by the Package Travel Arrangements 2018. If your holiday is a package, by law you have a right to expect the holiday booked and paid for. This means that if a failing by a company providing you package holiday caused your accident, you can make a claim against your tour operator. For example, if your accident was caused by faulty equipment at your hotel, your tour operator may be responsible. How can you make an accident claim against your tour operator? Whenever you suffer an injury on holiday, your first priority should always be your health. If you need medical attention, your hotel should be able to help you find the medical care you need. As soon as it is possible, you should also report your accident to your tour operator. This can be to a representative at your hotel or by contacting your tour operator by email. However, our experienced holiday claims solicitors would always recommend that you seek legal advice before accepting any offer of compensation from the tour operator. By talking to the experts at YourHolidayClaims, you can receive free advice on whether you may be entitled bring a claim against your tour operator here in the UK. To talk to a member of our dedicated team now, call us on 0330 100 2851. If you do choose to pursue a claim against your tour operator with YourHolidayClaims, our specialist holiday claims team will handle all legal aspects of your case from start to finish. We handle all claims on a no win no fee basis, meaning in the event that your case is unsuccessful, your claim wont cost you a penny. You can read more about our no win no fee policy here. Our dedicated solicitors will start your case by sending an initial letter of claim to your tour operator. They will then have 6 months to investigate the case. During this time, our legal experts will help you gather any evidence you need to support you claim. This can include witness statements, medical records, evidence of loss of earnings and out of pocket expenses caused by the injury. Our experienced team of solicitors will then fight to help you secure the maximum amount of compensation for your claim. If youd like more information on making a claim with the experts at YourHolidayClaims, call us now on 0330 100 2851. Or, if youd prefer to arrange a call back with a member of our team, you can complete our online contact form here.